Tēnā koutou! Welcome to the Point View School Community where we learn together. Situated amongst the beautiful east coast bays of Auckland, along the southern edge of the Waitemata Harbour, Point View School is a contributing primary school with around 850 students aged 5 years to 11 years. Founded in 1997 the school has a strong reputation for high standards, highly skilled and caring teachers and well-developed programmes of learning. 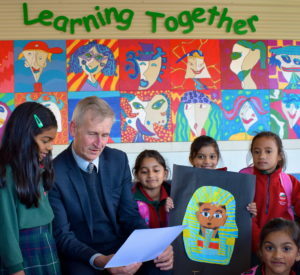 Great facilities, a dedicated Board of Trustees, excellent resources and high levels of professional learning for staff ensure that Point View remains highly valued by its families and whānau. Point View School encourages a close and collaborative relationship with its local community which comprises a rich variety of cultures. All are welcomed and celebrated at our school. Hand in hand with our families as we learn together, we prepare students for their future. We aim for students to leave Point View School as well rounded, confident young people, equipped to learn independently, collaborate effectively and contribute to our society in a positive and productive way.